The Reset Default Settings functionality is integrated in all our themes since 22.07.2015 in all our themes. It provides powerful way to reset your settings to fit in the design of the theme. You can find the button in the settings of the theme plugin in the administration. When you click the button, a popup appears, showing all settings that were changed by the theme. Each row shows the setting key, the current value and the default(recommended) value. Setting Key - the unique key of the setting, by which it is distinguished and accessed. Current Value - the current value of the setting, which is used by the site at the moment. Default Value - the default(recommended) value of the setting, which will be applied if you choose to reset it. The different settings are highlighted and checked by default, so the difference can be easily spotted. 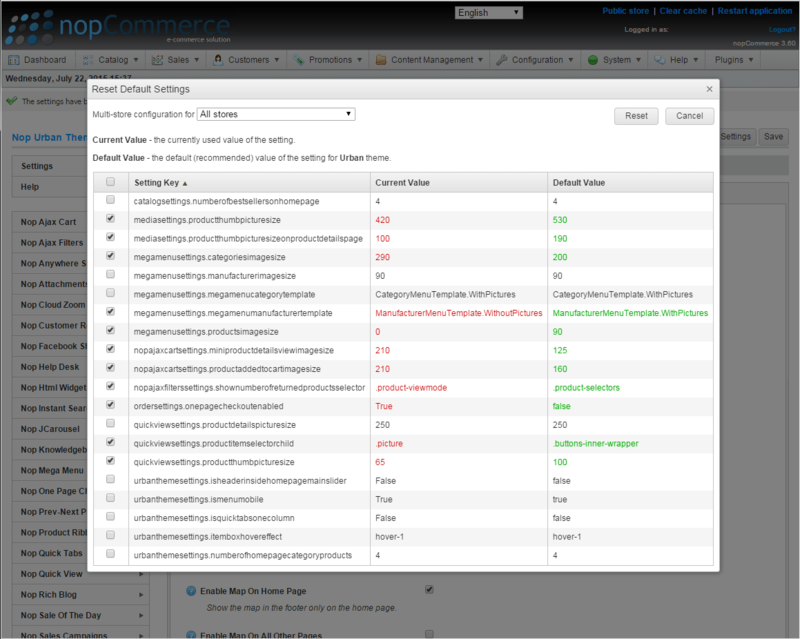 The functionality works per store - when the dropdown, which is in the top of the popup, changes the settings grid will automatically refresh, showing the settings for the selected store. Once you reset the settings you will be redirected to the selected store. This functionality is very useful if you use multistore with different themes. Example: You use the Native theme for your first store and the Urban - for the second store. When you first install both themes, the second one will override the settings applied by the first (because unfortunatelly the settings are not stored per theme in nopCommerce). So, you go to the first theme and reset its settings only for the store in which you use it.